is a group that uses only bamboo instruments, most of which were made by group-leader Neptune. See pictures of the bamboo instruments made by John Kaizan Neptune and used by TakéDaké. 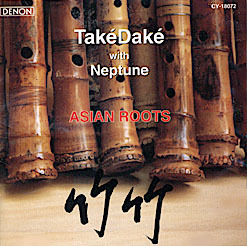 A love and appreciation of the world's music, especially Asian music, is part of the message of TakéDaké. Our music has been directly influenced by the great musical traditions of Japan, China, India, Indonesia, and others. Instruments, rhythms, scales, and structure all find a unique expression in different cultures, and provide a fertile ground for growing new sounds with only bamboo. The bamboo used in TakéDaké comes from Japan, China, Indonesia, Philippines, Vietnam, Cambodia, Malaysia and Hawaii. By using only bamboo we hope to showcase the importance of this flexible material in those various cultures. Called "the brother" in Vietnam and "the friend of the people" in China, it is not an exaggeration to say that it has a major influence on the way people live. All music composed and arranged by John Kaizan Neptune.